← Let ‘Em Roll Baby! The alabaster Etruscan town of Volterra, commune of Pisa, is turning medieval from the 21st to the 28th August. From daybreak to nightfall Volterra will be animated by fiery warhorses, fearless knights, noblemen and ladies, artisans and merchants, common people and peasants, flag-wavers and crossbowmen, musicians and jesters. The climax of the programme is the “Festival Day of AD 1398”. The town centre will come to life with a never-ending past, rich colourful performances and music. 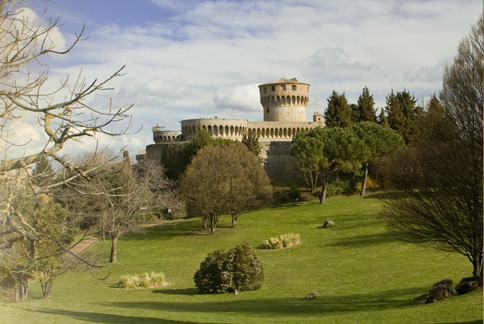 Under the shade of the Medici Fortress will be a military camp where visitors can enjoy performances with arms and falconry, while in the Archaeological Park medieval country life returns with a village of peasant farmers, courtyard animals, shepherds, the monastery and its monks. Two distinct environments from which to chose from. To make everything more realistic, Volterra in those days will (re)introduce the ‘Grosso’, the currency circulating during the Middle Ages. Food, wine and handicrafts may only be purchased with these coins, available at the ‘Old Exchange Office’. A unique occasion to experience, as if by magic, medieval times in one of the most beautiful towns in Tuscany. Volterra, in fact, lies in the Chianti Pisano and borders with other Chianti towns belonging to both Florence and Siena. It is thus surrounded by beautiful rolling hills covered in vineyards upon which it dominates from its over 500 metres of altitude. Tuscany Holiday Rent offers a wide selection of holiday homes in the area of Pisa from which to choose for your holidays. Questa voce è stata pubblicata in Culture and accommodations in Tuscany, Festivals and feasts in Tuscany. Contrassegna il permalink.